Cheaply Buy Silver Beads? You Mean, That's Possible??? Trying to buy silver beads that are high-quality and inexpensive is like expecting an all-cake diet to help you lose weight – it's almost an oxymoron. But believe it or not, it is possible (at least, the bead part). Stick around, and we're going to show you how. The selection of your beads is something that everyone in jewelry-making knows is important, but just how important? Well, the design of your accessories will be based on your trinkets, your sparklies, your shiny little baubles. This means that your sales will be based on them, too! And, of course, one of the best types of beads you can create jewelry out of is sterling silver, whether filled or plated. The problem is, sterling silver beads aren't exactly cheap, are they? And if you're new to jewelry making, they can make or break your budget. So, what's a jewelry-maker to do? As always, research! 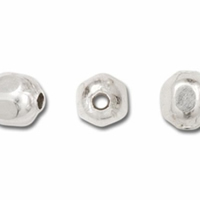 There are a few simple truths that you need to know when you buy silver beads. First, some suppliers sell beads by weight, not amount, so the price listed on the website (or sales rack) might be approximate. Don't forget to check on this before checking out – you might just purchase the most expensive 'deal' of your life! Second, there are a lot of different types. These beads don't just come in spheres. Thai Hill Tribe Silver Beads come in all shapes, sizes and designs. They're hand-crafted by the Karen Hill Tribe, and you can always be confident in absolute uniqueness – no two beads are ever exactly alike. There are also Bali Silver Beads. Indonesian craftsmen mold and create these ornaments, which are usually some sort of rounded or curved shape, but can also come in the shape of seashells, stars... Anything, really. Hand-etched, they're also completely unique. The third thing you need to know? There are imitations, just like in any section of the jewelry world. Bali beads, in particular, have quite a few fakes out there. Be careful, and buy from a reputable dealer – not just some random company, but someone that you've researched or worked with before. Not sure where to go? Ask around. You can even go to our jewelry supply question page and post an inquiry about it – I'm sure our readers will be more than happy to help you out! The fourth and final thing that you absolutely must know when you buy silver beads? The prices fluctuate. Welcome to precious metal shopping – worth jumps up and down faster here than it does in the stock market. What does this mean for you? Double-check your prices before checking out, and compare prices between reputable suppliers. Sometimes it's wise to wait and see if the prices drop. Just remember – you don't have to figure it all out right now. You'll naturally discover the best price for your particular favorites the more you look them up. If you plan on using silver beads often, check once a week or so and keep track of the average prices. This will help you know when the best time to buy is throughout the year, month or week. We've Got the Basics Down – It's Time to Buy! Alright, to begin, set your budget. This is a non-negotiable number – the most you plan to spend. Don't let yourself get pressured into going over it. Shopping online makes this part particularly easy, since there isn't an employee or store-owner trying to get a sale out of you. Of course, you also can't feel the beads when you're shopping online, and you have to rely on their photographs. It's a give-and-take. Next, find that supplier! You need to search for a reliable and budget-friendly seller before you can buy silver beads. But beware! Don’t go rushing in and buying sterling silver beads in a snap – ask around, first. How much are their beads? Are they sold by weight, or in specific and pre-separated amounts? Try to check out various craft shops in your area and online - find the supplier that suits your personal budget and ambitions the best. Lastly, try to make a deal. Some stores will bargain with you, and most (online and off) will offer a hefty discount when you shop wholesale. If you plan on making more than one piece with your selected beads, it's definitely worth looking into. Again, remember that there are imitations. Follow that old saying – if it seems too good to be true, it probably is! So, what are you waiting for? It's time to go shopping! You now have all the tools you need to buy silver beads, without killing off your entire jewelry-making budget – get to it!